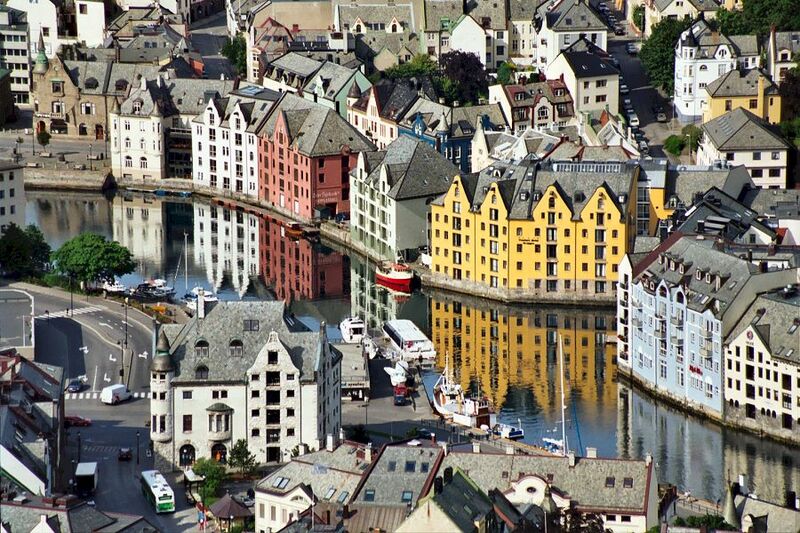 The next stop during my Norway trip 2003 was the city of Ålesund. I only made a short visit (one day), but I hope you will enjoy reading about it! In the first part of the day we did some sightseeing in Ålesund itself, visiting the aquarium, the old city centre and a rather unusual church. After that we hit the road and started driving towards Selje. 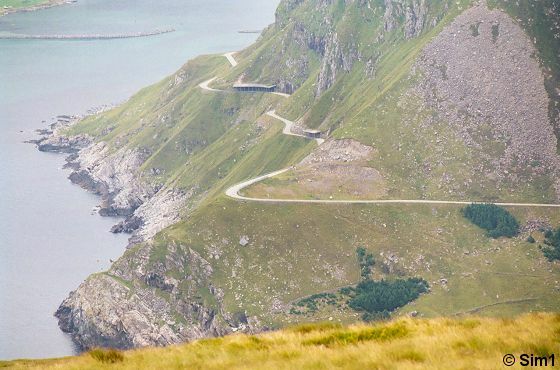 The drive from Ålesund to Selje is approximately 115 kilometres. On the map you can see the route we took. The orange lines on the map indicate the ferry routes and the green dots are the places we stayed overnight. Ålesund is situated on the west coast of Norway. 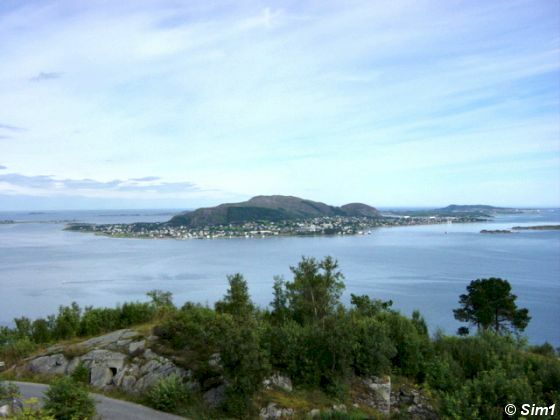 It is the largest town between Bergen and Trondheim. 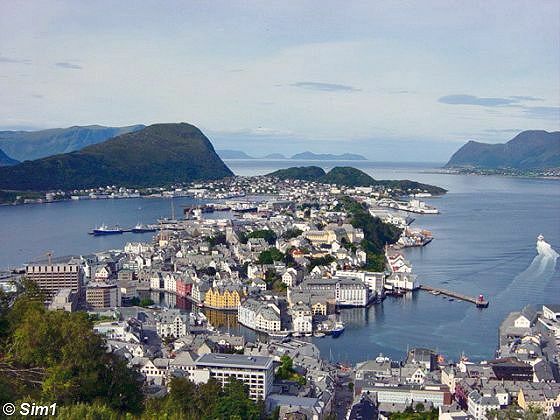 Ålesund is 533 kilometres from Oslo and 378 km north of Bergen. Trondheim is 287 km away. 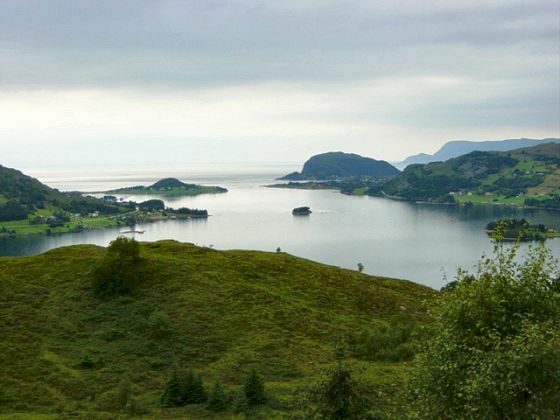 When you travel to Ålesund a thing not to miss is the view from the city mountain Aksla. The view from here is wonderful. On top of the mountain is a Fjellstua with a restaurant and a viewing platform. You don't need to go to the restaurant though to enjoy this view. Close the restaurant there is a rock area where you can climb on to, where you have this beautiful view over the city. In the picture on the left hand side you can see a bit of the restaurant hidden behind the big tree. This is another picture taken from the city mountain Aksla. You not only have a nice view over the city, but also over the surrounding islands. To go up to Aksla you can either take the 418 steps that go up from the Town Park or you can drive all the way up the mountain by taking the Borgundfjordveien / Fjelltunveien. 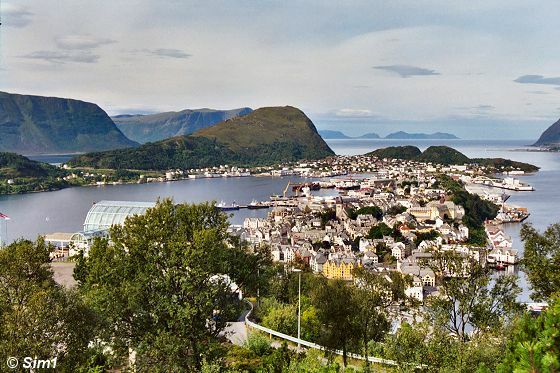 The part of the city that you can see from the view point at Aksla Mountain is the part that has given the city of Ålesund its name. "Ål" means "Eel" and "Sund" is Norwegian for "strait". Looking like at little stretch of land in the water, it is not a bad name at all for this place. Using my zoom lens I could have a real nice view over the buildings in the city centre in Ålesund. I really liked this part of the city with the old warehouses along the canal. 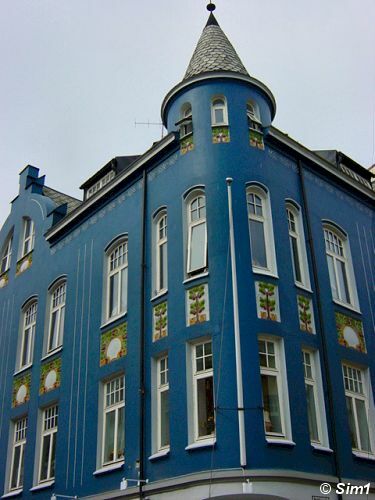 Ålesund is known for its Art Nouveau architecture. In the city centre you can see lots of building full of turrets, spires and all sorts of creative ornaments. This makes that parts of the city look quite picturesque to see, it is great to look up and see all those architectural details. It is also the part of Ålesund I liked the best. But I have to admit that all in all Ålesund couldn't excite me that much. Maybe after all the bad luck I had here so far all I wanted to do was escape and travel south where some beautiful islands of Norway were waiting for me to be discovered. The Ålesund aquarium or Atlanterhavsparken (The Altantic Sea Park) is located at Tueneset, which is about 3 kilometres west of Ålesund. 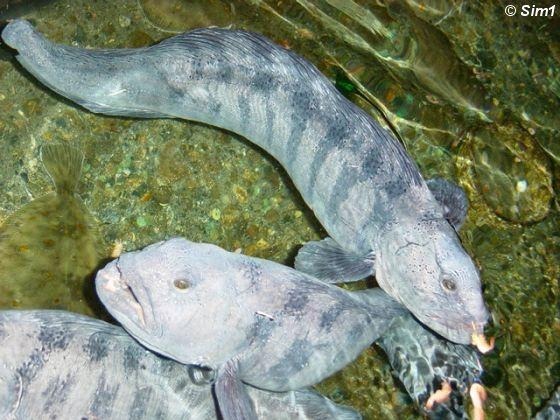 The aquarium mainly focuses on the Atlantic Ocean from north to south. The advertising for the aquarium is really good, but when you go here you will be rather disappointed.... or at least I was! The aquarium doesn't look anything like in the brochure and hasn't that fantastic displays. And for the price you pay to get in I would call this a real tourist trap. I didn't spend much time at the aquarium as I really didn't like it, and got out with a rather annoyed feeling. While preparing for our trip to Norway, we read about this totally of the beaten path location in Ålesund: the Volsdalen Church. 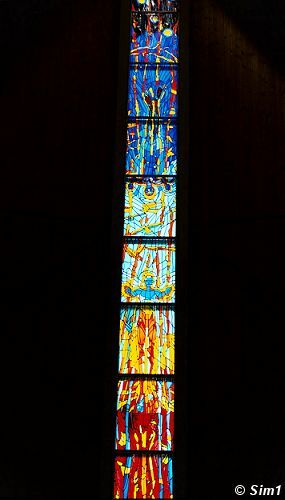 The church is really new (from 1974), but it is special because of its 15 meter high stain glass window. That sparked our intrest and decided it was something we wanted to see. The Volsdalen church itself is rather basic and modestly decorated nothing really spectacular about it. But the one thing that catches the eye right away is the huge glass stained windows. They are 15 metres high and so colourful. 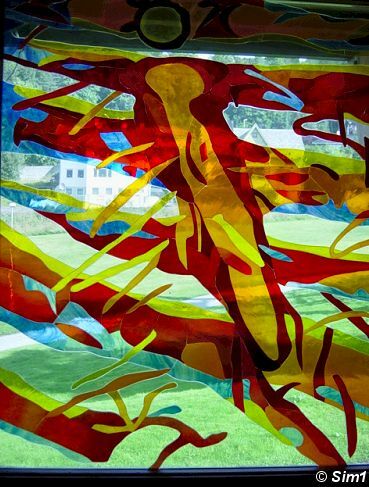 The artist that created the windows and the three paintings below it is Frans Widerberg. It was special to sit here in front of the church, staring up at those huge stained glass windows and see how the light filtered through every colourful piece. Seeing these pictures again, brings back that quiet special moment, that moment of thoughts. I am glad I went here. While walking out of the church you will pass this wall on the north side of the church, with also glass windows created by Frans Widerberg. 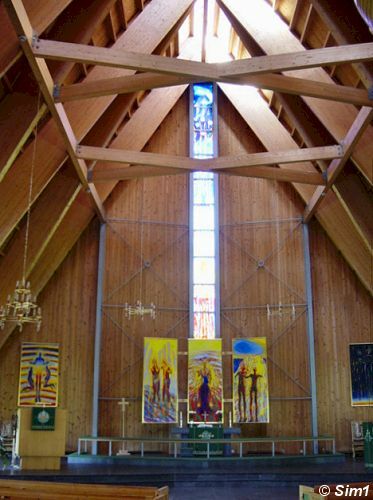 They were added to the church in 1993. I am not sure if I would make a detour for this church, but if you are in Ålesund, it might be worth to visit it. 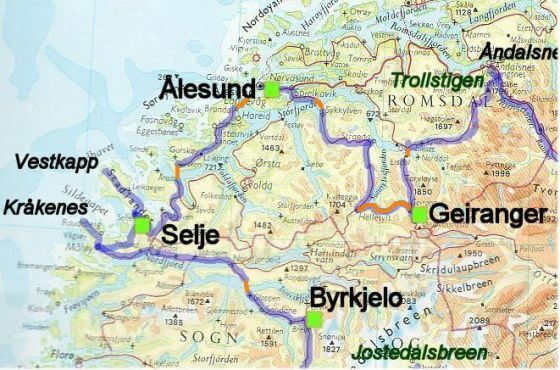 From Ålesund we decided to do some island hopping to get to Selje, a route that required taking the ferry twice, and the total length of the trip was about 115 kilometres long. The first ferry we had to take was from Sulesund to Hared. This ferry takes a bit longer than usual: 25 minutes. Catching the ferry won't be much of a trouble as it goes 35 times a day. A car including driver costs 71 NOK; a passenger 25 NOK. I really loved my trip through Norway and I will certainly go back here some day. But my 'virtual' journey hasn't come to an end yet. My next page will be about Selje, Vestkapp and Kråkenes.